Trader Joe’s makes this unique spread, which is made of crushed spice cookies, sugar, and oil, among other things, and it has a texture similar to peanut butter. The ingredients in the store-bought version are pretty undesirable, so I figured I’d make my own at home for an easier and healthier alternative. The thing is, I don’t see much purpose to having cookie butter around, because I can’t imagine spreading cookies onto toast. I’d rather have a smoothie if I’m going to have something sweet in the morning. But, freezer fudge is something I always have on hand at home, so I thought maybe a Cookie Butter Freezer Fudge would be tasty, too. Similar to the Trader Joe’s Cookie Butter, this fudge tastes similar to gingerbread with a rich and creamy texture. But, unlike the Trader Joe’s version, my homemade cookie butter is gluten-free, naturally sweetened, and requires only a handful of all-natural ingredients. I hope you enjoy it! Combine all of the ingredients in a mixing bowl and stir until smooth. Line an 8-inch square pan with parchment paper and pour the mixture into the bottom, using a spatula to smooth the top. Place the fudge in the freezer to set until firm, about 1 hour. 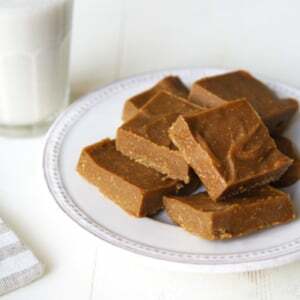 Slice into small squares and store the fudge in an airtight container in the freezer. Serve it directly from the freezer, as it will melt very quickly at room temperature! 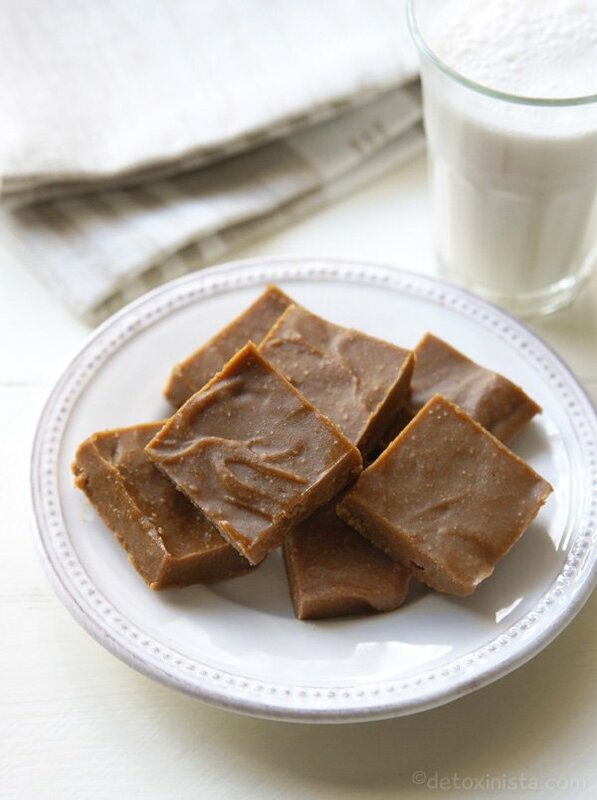 A quick and easy freezer fudge with a gingerbread flavor and creamy texture. Place the fudge in the freezer to set until firm, about 1 hour. Slice into small squares and store the fudge in an airtight container in the freezer. Serve it directly from the freezer, as it will melt very quickly at room temperature! Notes: I haven’t tried making this with any other nut butters, but I assume others could be used with a few modifications. Almond butter I’m sure would be delicious, and for a nut-free option, sunflower butter could work, too! Since this is a no-bake recipe, you can simply taste the mixture as you go and adjust the taste as needed. As always, you can use any other liquid sweetener you like, and coconut oil can be replaced with real butter if you don’t need this recipe to be vegan. Reader Feedback: Have you tried Cookie Butter? If so, are you a fan? I had just tasted cookie butter for the first time recently. I thought it was good, but this knocks it out of the park for me. And it was ridiculously easy to make. I love the other commenters’ ideas of switching out the cashew butter sometimes for 1/3 cup each of almond butter, cashew butter, and sunflower seed butter, or adding ground flax and chia, but it’s amazing as it is. Thank you! I just made this. I have only tried your “sweets” recipes so far and all of them have been delicious; this one is no exception. Your recipes make it easy to transition to healthier eating. Thank you! I’m allergic to cashews can I use something else instead? I made bars with this “butter” as the base. . . amazing!! I skipped the coconut oil, but added 2 cups oats, and 1/2 cup mixed chia seeds & ground flax. Thank you for the inspiration! Is this made with a roasted nut butter or a raw nut butter? Just want to be clear before I make it. Glad I found your site! I always use raw nut butter when possible! I made this today as a treat after I made the cauliflower crust pizza, from the Everyday Detox Cookbook, for lunch and WOW!!! This is absolutely delicious!!! Thank you for all of your recipes and the food combining info!! I just made this, I must have done something wrong? My ingredients just would not mix with the coconut oil. I used everything except the molasses. I let it go in my food processor for what seemed like forever. Ask I was left with was a very sticky glob with the oil separate. Weird! Maybe because I made my own cashew butter?? I’ve experienced oil separation like that by over-mixing nut-based batters. Maybe try mixing it by hand next time? Obviously meant to say Amazing! This looks amazon! I’m so terrible at making fudge. This gives me the motivation to try again. So subbing maple syrup for the molasses won’t change it too much? You can just leave the molasses out– you don’t need a sub, since it’s just for added gingerbread flavor. 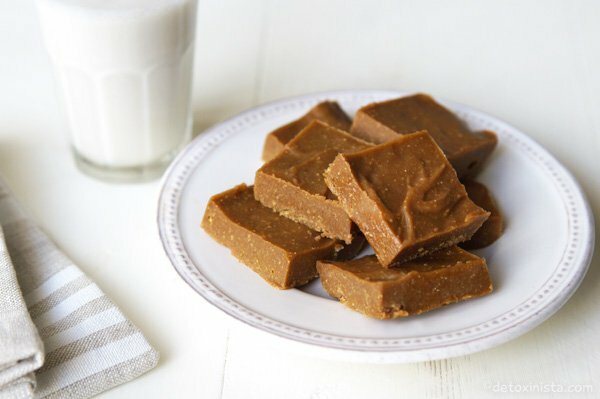 I made this fudge this past weekend and it is AMAZING! My husband was very sad when he could no longer eat cookie butter and he was so happy to have this recipe. I added a little coconut oil/cocoa powder glaze to the top and used fresh ginger since I couldn’t find any ground ginger but it was still so delicious. My husband and I have been on a healthy living journey for about 3 years now and after some ups and downs we have lost a combined 125 pounds thanks to a mostly paleo/low carb diet and exercise. Your website has been so very helpful providing wonderful recipes and information to help us along our journey. Thank you for all you do. I’m so glad to hear that! Congrats on your success so far! You can find cookie butter in waitrose and sainsburys (its called Lotus Biscoff Caramelised Biscuit Spread)…not gonna lie, it is really good…but Megan’s recipe is much healthier! Yes, I was going to add that I’m pretty sure TJ’s didn’t invent it (just like Halo didn’t invent the baby sleep sack). Oh well. I tried this recipe with 1/3 cup each of almond butter, cashew butter, and sunflower seed butter. It was amazing! Thank you for another excellent fudge recipe. You are my inspiration! Dear Megan, I do agree with you entirely on the cookies on bread issue. I have never been able to eat carbs-on-carbs (like the French loaf with fries… Eeeuw). Your freezer fudge will be my downfall so I won’t make a whole batch and just adjust the single portion chocolate almond fudge recipe ?. One question before I dive in… If I’m using a springform pan, do I still need to use parchment paper, or will a quick spray of coconut oil suffice? I always use parchment paper. Since coconut oil solidifies when chilled, I’m not sure how it will work for greasing the pan in a chilled recipe. Used the parchment paper and totally see what you mean about how it would have been too greasy if I had skipped that step and greased the pan. My goodness it’s delicious! I think my pan must have been 9×9 because it came out very thin, but who cares when it tastes that good?!? Either way, mixing it into vanilla ice cream seems like the best idea ever! I think you should create a recipe for peanut butter and jelly fudge!!! Megan! 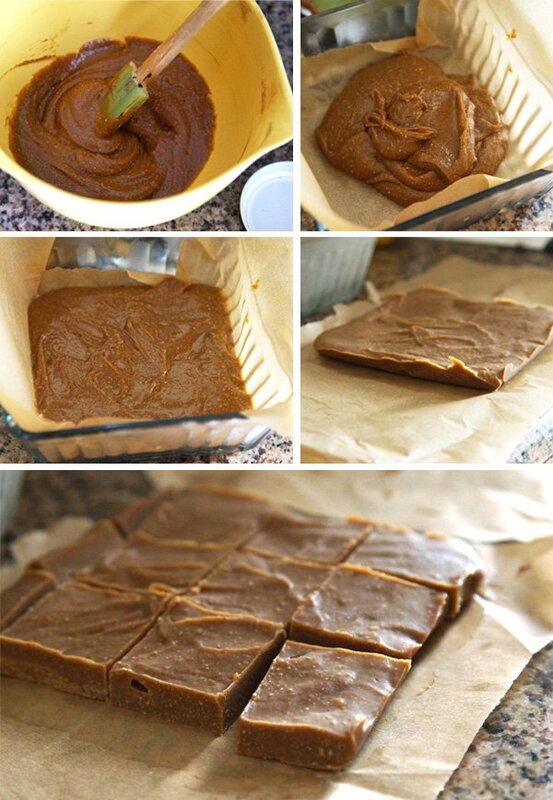 This sounds totally addictive for all the right reasons…I am obsessed with your almond butter fudge- so good! I now keep a stash in my freezer 24/7 just in case i need something quick. Would love to see more ideas with lean animal proteins on your site:) and have been copying a lot of your chicken/salad greens ideas lately. I am a competitive athlete and yogi as well, and often i find that i am not sated without eating at least some animal protein daily. Dinner suggestions? This is AMAZING! It’s like you read my mind:) So looking forward to trying this. Thank you! Yum! I’ve never had the TJs cookie butter, but I’ve certainly heard about it! This take on your freezer butter sounds much better though! Can’t wait to try! TJ’s cookie butter is my husband’s favorite, and rare, treat. I cringe when I look at the ingredients. This will be an awesome alternative. Thank you!!! I LOVE cookie butter! I can’t allow it in my house because I will eat half of the jar in one sitting with a spoon. Luckily where I live it’s also expensive ($6! for a teeny jar) so it takes a lot for me to buy it. I’ve only ever purchased 2 jars. I wil definitely have to try this recipe. I’ve made your other freezer fudge recipe and added the tiniest bit of cardamom. It reminded me of an Indian dessert called besan burfi. If you haven’t tried it, I would suggest it with a tiny pinch of cardamom, since it’s really strong, and a bit of rose water could make a nice variation. Thanks for making and sharing such yummy treats!!! I turned 45 this year and have noticed a change. I work out regularly and eat clean when being “good” with my diet. I have gained a few pounds about 6, however feel that I’m in a rut with my eating. I feel that I need to rev up my metabolism. Food combining is extremely important however this is one area I don’t know much of. Any thoughts? I think you might be my favorite person! Cookie butter is one of my favs, but it is so unhealthy, I usually try to steer away from it. I can’t wait to try this tomorrow!